Short days, colder nights and even some snow on the mountains...must be October in Moab. We've been busy cleaning, repairing and putting away the rafting equipment here at Sheri Griffith Expeditions, but we have found some time to get out and play, too. 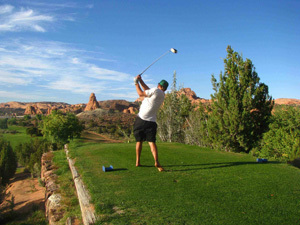 We still have beautiful weather for spending time on the water, in the canyons and on the golf course. Brenda took some time to explore Cataract Canyon, launching on the evening of September 30th so that she could beat the "shutdown". She explored some side canyons and was excited to show us the pictures of the arrowhead she found (and left) there. Kristl took her family and friends for a "Ducky Day" on the Daily Stretch of the Colorado River and had lots of fun playing in the sand and building sand castles with her kids. Arlo took some time to kayak on the Colorado River for a day away from the computer and brochure planning. Jose has taken some great hikes to area petroglyphs, and is planning some more fun excursions with his family. Marshall and Nicole took their family on a Labyrinth Canyon excursion. Rich took his family down Cataract Canyon. Aaron hiked into Cataract Canyon and then rafted down from the Confluence. Izzy is planning a Cataract Canyon or Labyrinth Canyon trip for next week. Max and Tabitha have spent time in Pennsylvania with Tabitha's family, and are planning a trip to Costa Rica in November. Stephanie is traveling abroad, visiting Italy, Sri Lanka and other destinations. One activity that Brenda, Rich, Sara Jane and Christian are going to participate in this weekend is the Moab Regional Hospital Charity Golf Tournament. The proceeds from the tournament benefit the hospital's Digital Mamography Services. Brenda's team may not be the best on the course, but they'll probably have the most fun!